Michael McFadyen's Scuba Diving - Bait Reef, Queensland On our 2015 sailing trip to northern Queensland, we had hoped to dive quite a few coral reefs and atolls on the Great Barrier Reef. However, the weather and other circumstances limited the number of places we dived. We spent about one month in the Whitsunday Islands area and did quite a few dives there (see other articles). While in this area, we decided to look for a weather window when we could sail out to the reefs north of Hook Island. There are quite a few reefs, but the ones that interest us are Bait and Hook Reef. It is 18 nautical miles (33 kilometres) from Hook Island (the northernmost of the Whitsundays). It only takes us just over three hours to sail Catlypso from Butterfly Bay on Hook Island to Bait Reef. A satellite photograph of Bait Reef showing our sailing tracks in and back from Hook Island. We dived just south of where the tracks enter the "lagoon". 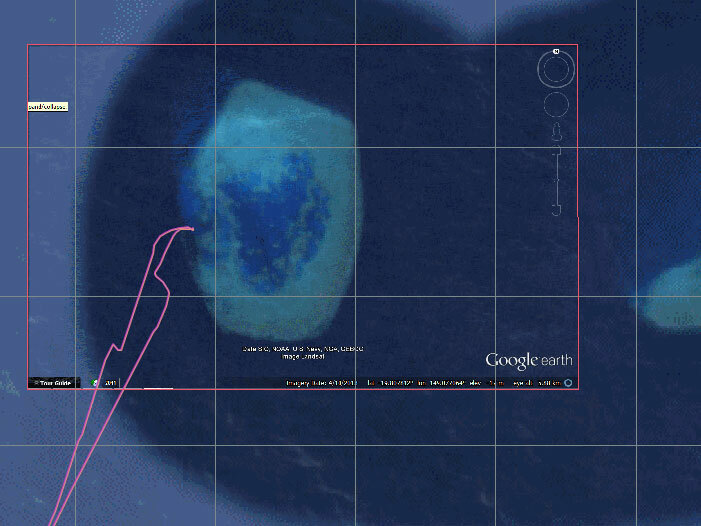 Bait Reef is not a huge reef, 3.3 by 2.3 kilometres in size. It also only rises less than a metre above the surface of the ocean at low tide. At more than half a normal tide, it is totally underwater. At Bait Reef there is a small section inside the reef where yachts can moor. There are five moorings inside this "lagoon", all near the very small entrance from the open water. Once moored, we decide to have a look at the reef just outside the entrance, especially on the south side. We are moored on the closest mooring to this spot. We motor over in our 3.4 metre RIB, Thunderbird 2 and check out likely spots. We do not have a depth sounder, but we can see the bottom in the extremely clear water. The reef is composed of a series of large bommies that almost join up, but which have gaps in between through which we can take Thunderbird 2. 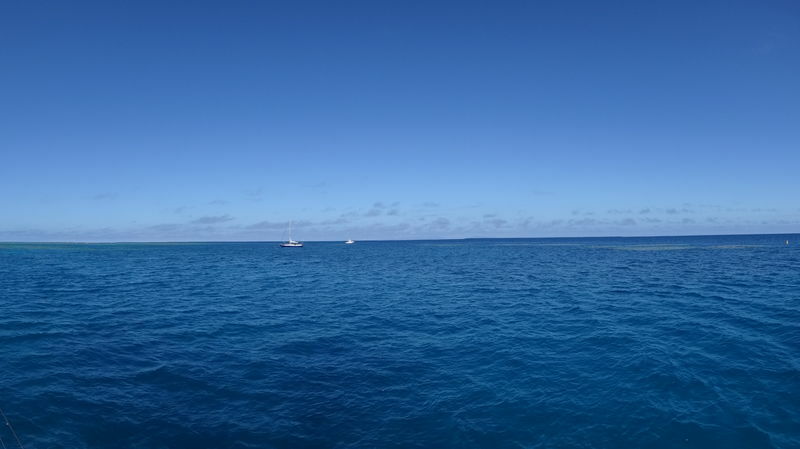 A panoramic photograph of the reef looking back from our mooring towards Hook Island. We dived on the outside of the reef at the right. We motor over to a nearby boat and tell them we are going to scuba dive and ask them if they can watch our yacht as well as our RIB. They advise they are going to go for a snorkel where we are going to dive so they will keep an eye on both for us. We go back to Catlypso and gear up. As mentioned above, we decide to dive the spot just outside the entrance. This is called The Stepping Stones. We go over in Thunderbird 2 and go just outside the reef and anchor in between two bommies. We go south along the wall which drops to 23 metres and then slopes deeper. There are lots of overhangs and cracks in the reef wall. We go past the next gap between the bommies and around some smaller bommies. We head back a bit shallower to the anchor and then go north. There is a tunnel into the lagoon from outside that we went through. We come back outside the reef and head north again but the current gets stronger so we turn around. The current has been all over the place on this dive. We go back to the anchor and spend rest of our time doing a safety stop around the bommies. We saw three white-tip reef sharks, some clownfish, a titan triggerfish, some larger fish, a saw-tooth tuna (? ), lots of flutemouth and a number of species of nudibranch. It was a brilliant dive with visibility of at least 30 metres. The next day we do another dive here. We anchor a bit north-east of where we did yesterday, much closer to the entrance to the anchorage. The water is even cleaner than yesterday, probably 35 to 40 metres. We head north-east to the entrance channel. We see a couple of sharks, a white-tipped reef shark and a black-tipped reef shark. We go a bit into the channel before turning around. We go back along the reef towards where we anchored yesterday. There are a couple of very large anemones, one with pink anenomefish and the other with Clark's anenomefish. As mentioned above, the reef has a shear wall to about 20 or 22 metres. We pass the tunnel we swam through yesterday. We turn around where we anchored yesterday and on the way back we see a wobbegong shark on a small ledge on the wall. This was a totally different species to any wobbegong we have seen before. It was very short but extremely wide. Now I am back home, I think that it was a tasselled wobbegong. There are plenty of gorgonias, sea whips, harp sea whips and lots of soft corals. We go back to where are anchored and spend the rest of the dive in the shallows. Other fish we see are lots of flutemouths and blue damsels and a few batfish. We also see a blue-faced angelfish, a regal angelfish, some barramundi cod (with a remora on one) and different species of butterflyfish. There was also a large Maori wrasse near the anchor. This really is an excellent dive site. I wish we had one or two other people on the boat as we could have done more dives even further afield than this spot.